WASHINGTON (Dec. 14, 2009) -- On the western side of the Pentagon, at the memorial to those who died during the Sept. 11, 2001, terrorist attack, volunteers had mounted 184 evergreen wreaths on the fence -- one for each person who died there. The wreaths are identical to those which have been placed for years now on graves at nearby Arlington National Cemetery. This year, for the first time, they are being used to honor those who were killed as part of the Sept. 11 attacks. 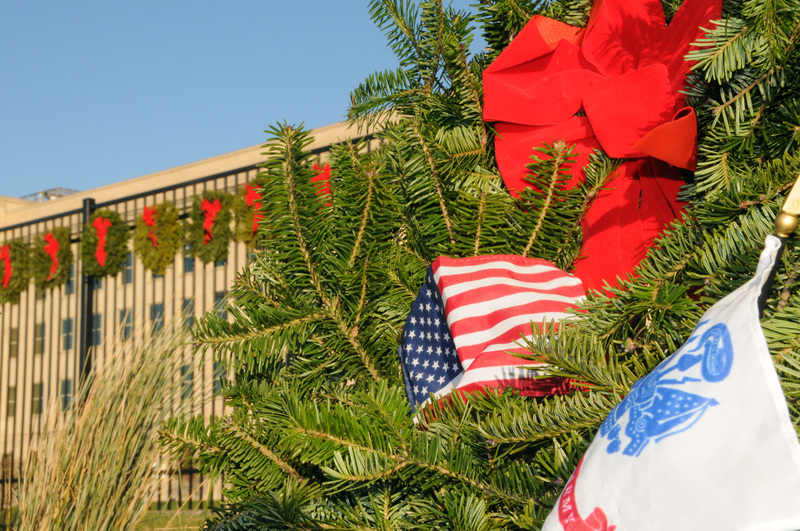 Some 184 evergreen wreaths were placed at the Pentagon Memorial, one for each victim killed there in the Sept. 11, 2001, terrorist attack. "Why we're here and why we're including the victims of 9/11 (is) because they are casualties of the war on terror -- no different than any other war we have been to," said Morrill Worcester, of the Worcester Wreath Company, during a ceremony Dec. 11 at the Pentagon Memorial. "We just don't ever want to forget these people, that's why we are doing what we are doing." Worcester's business, the Worcester Wreath Company, has been placing wreaths at Arlington National Cemetery since 1992 -- most recently through the charity Worcester started, "Wreaths Across America." This year, for the first time, the company, along with corporate sponsor Wal-Mart, donated some 3,000 wreaths to be placed at all three 9/11 sites: the Pentagon; Battery Park, near the World Trade Center site in New York City; and Shanksville, Pa., where flight 93 crashed into the ground. "It's to acknowledge, honor and remember those losses that day," said Kathryn T. Cross, a Gold Star Mother and volunteer for Wreaths Across America. It was Cross who contacted Worcester and asked if she could get wreaths to honor those killed during the 9/11 attacks. Between Worcester and sponsor Wal-Mart, Cross was able to get the wreaths to place at the 9/11 locations. "This is due to the efforts of a lot of people that helped to make this possible," Cross said. "I did this from a mother's heart. But this is for all of them, and most significantly, this is for those who you cannot see, that are not with us today." Jim Laychak, president of the Pentagon Memorial Fund, said he hopes the wreaths will become a permanent tradition at the site. "I remember Karen Van Lengen, who was at the time the dean of the School of Architecture at the University of Virginia, talked about looking forward to seeing what types of traditions and rituals that would develop after the memorial was built," Laychak said. " I hope that this -- the wreaths coming here during this very special season -- is one of those special rituals that will continue in years to come."